The church: St Virgilius, Broad Channel, New York, USA. Comment: We have received a comment about this report. The building: A simple frame structure dating from 1924, covered in light cocoa shingles, with school attached. The interior appears to have been done over recently, and is beige with light brown wood paneling. The nave is carpeted in blue, and the sanctuary in purple. A simple communion table sits on a raised platform, at the rear of which is a large crucifix against a dark blue backdrop. To either side of the crucifix are statues of Mary and Joseph against a similar backdrop. The whole is illuminated by fluorescent lighting, with spotlights highlighting the sanctuary. 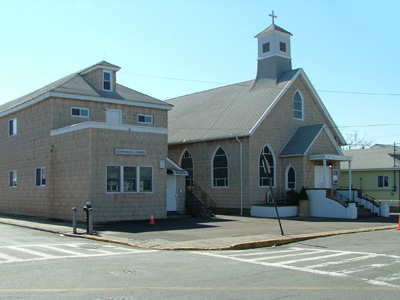 The church: This is one of only two churches in Broad Channel, the other being Presbyterian, located next door to each other. The announcement sheet mentioned weekly devotions to the Miraculous Medal and St Anthony and a religious education program, but did not list any parish organizations or give any other hint of what parish life might be all about. The neighborhood: Broad Channel is a neighborhood in New York City's borough of Queens that sits on a flat, marshy island in the middle of Jamaica Bay with the wonderful name of Big Egg Marsh. To look at Broad Channel, one would scarcely believe that it is part of New York City. Rather, it resembles a small fishing village, with plain wooden or stone houses and narrow lane-like streets. The New York City skyline looks tiny when seen from such a distance. Big Egg Marsh was virtually unoccupied until 1880, when a railroad bridge opened it up to fishing and recreation. During Prohibition, the island's relative inaccessibility made it a haven for rum-running. When Cross Bay Boulevard was built in 1923 connecting Broad Channel with mainland Queens, the island began to acquire its first permanent residents. Today most of these are white, middle-class families of Irish or German descent, and most have lived there for generations, in the same family home, marrying within the community. Broad Channel became infamous in 1998 when the neighborhood's Labor Day parade included a racist float, an incident that led to the firing of three city officials and the issuance of a public apology. The cast: The Rev. John S. Wtulich, pastor, assisted by a lector and two eucharistic ministers whose names were not given. The date & time: March 12, 2006 (second Sunday in Lent), 11.30am. The church can hold about 250 people; I counted about 70. Most sat toward the back, with only the old people venturing to take the forward pews (Miss Amanda chose one in the middle). Father Wtulich, vested for mass, was standing on the porch as I entered, and he said good morning. Some others who were standing nearby smiled and nodded but didn't say anything. Yes. It was a plain, uncushioned wooden pew, but quite comfortable. People entered quietly, most at the very moment mass was scheduled to begin. None. An announcement sheet was stacked on a table near the door, but it contained only news items and advertisements, no order of service. The Catholic Community Hymnal was available in the pews, but we did not use it. None, nor did we sing any hymns. I noticed a large electronic organ in the gallery but it remained silent. Father Wtulich had a habit of reciting the prayers with his eyes downcast. The congregation's odd behavior at communion (see below) distracted me from my post-communion meditation. A typical novus ordo low mass. The entrance procession consisted of the lector, two eucharistic ministers, and celebrant. Father was vested in a purple chausuble and the lay people wore street clothes (the woman among them wore a purple suit). There were no servers. At the offertory, the lector brought the chalice and bread to the altar, but did not assist Father with making the chalice. We received communion under both species, although most people chose not to partake of the chalice. After noticing this, I began to count how many did (about one-eighth) vs how many didn't (all the rest). 8  Father Wtulich spoke without notes and his tone was quiet and personal. He began his sermon with a joke, but I didn't see the connection between it and his text. The transfiguration is a fitting meditation for Lent. Lent is an opportunity for us to spend some time alone with God and to learn who Jesus really is. This is a revelation that repeats itself over and over in our lives, resulting in constant spiritual growth. Receiving communion under both species in a Catholic church was a pleasant surprise. Good, sweet white wine, too. Someone's cell phone went off during the sermon, with a ring tone that sounded like a laugh track. "Someone must have just caught on to my joke," remarked Father. Come on, people! This is getting old. Either put the blasted things on mute or leave them home! I learned that my raincoat is actually a cloaking device. I shouldn't have been surprised, though – after shunning the chalice, did I really expect the congregation not to shun me? 1  I'll try the Presbyterian church next time. Yes. I was determined not to let this cold, lifeless congregation spoil it for me. How almost everyone walked right by the chalice as if it wasn't there.